Regulations concerning different modes of transport of dangerous goods are well harmonized at global level: they were then looked at as a model for developing Globally Harmonized System of Classification and Labelling of Chemicals (GHS), (on which CLP Regulations is based). Transport regulations do not cover some hazard classes, such as germ cell mutagenicity, carcinogenicity, reproductive toxicity, having been evaluated that such hazards are not relevant in transport because in general, in case of accident, no repeated and prolonged exposure takes place. Other differences with CLP Regulation are related to the use of "building block approach". Transport labels, which were used as a basis for GHS, can be used, instead of CLP pictograms, on packages during transport. Key words: GHS, CLP Regulation, UN Recommendations, transport of dangerous goods, classification, harmonization, labelling. Le regolamentazioni concernenti le diverse modalità di trasporto di merci pericolose sono ben armonizzate a livello globale: di conseguenza sono state prese a modello per sviluppare il Globally Harmonized System of Classification and Labelling of Chemicals (GHS ), (sul quale è fondato il Regolamento CLP). Le regolamentazioni sul trasporto non prendono in considerazione alcune classi di pericolo, quali la mutagenicità sulle cellule germinali, la cancerogenicità, la tossicità per la riproduzione, dal momento che tali pericoli non sono considerati rilevanti per il trasporto, poiché in genere, in caso di incidente, non si è in presenza di esposizioni ripetute e prolungate. Altre differenze col Regolamento CLP derivano dall'utilizzo del building bloch approach. Le etichette del trasporto, sulle quali si è basato il GHS, possono essere usate, sui colli in corso di trasporto, in sostituzione dei pittogrammi CLP. Parole chiave: GHS, Regolamento CLP, Raccomandazioni ONU, trasporto merci pericolose, classificazione, armonizzazione, etichettatura. In order to discuss the relationship among CLP Regulation  and transport regulations it is necessary to refer to the process of harmonization started at United Nations Conference on Environment and Development (UNCED) in 1992 and completed in 2003 with the publication of the first edition of the Globally Harmonized System of the Classification and Labelling of Chemicals (GHS) . The work on GHS began with the premise that existing systems should be harmonized in order to develop a single, globally harmonized system to address classification and labelling of chemicals in all sectors (workplace, consumer, transport). It has to be underlined that the concept of harmonization is certainly not a new one. In particular, as far as the transport regulations are concerned, harmonization among the different modes of transport was largely achieved around the world. In 1956 the first version of the "Recommendation on the Transport of Dangerous Goods" , prepared by the United Nations Economic and Social Council (ECOSOC)'s Committee of Expert on the Transport of Dangerous Goods, was published. At its nineteenth session (2-10 December 1996) the Committee adopted a revised version of the Recommendations, in the form of "Model Regulations", in order to facilitate its direct integration into all modal, national and international regulations. These Recommendations, which contain a very detailed set of criteria for classification and labelling of dangerous goods1 were (and are) then addressed to governments and international organizations responsible for regulating the transport of dangerous goods in order to ensure the safety of people, property and the environment and they. It was (and is) then expected that governments and international organizations, when preparing or revising their regulations will conform to the principles laid down in these Recommendations - Model Regulations. it can be easily verified that the requirements concerning aspects common to all the modes of transport (such as packaging, documentation, and, of course, classification and labelling of dangerous goods) are largely harmonized. It was then recognized that the transport sector could be referred to as model for the harmonization: harmonization which had not been achieved at global level, in terms of classification and labelling, in the workplace or consumer or others sectors. It has to be noted that such criteria are mainly based on the results of tests performed in accordance with the procedures defined in the Manual of Tests and Criteria annexed to the UN Recommendations. The Recommendations on the transport of dangerous goods were developed and amended by the Committee of Expert on the Transport of Dangerous Goods. The members of the Committee were experts from different countries (the countries were identified by the ECOSOC); experts from other countries and from NGOs (non-governmental organizations) also attended the meeting without the right of vote. Every two years (following intermediate meetings: one every six months) the Recommendations were amended to take care of the developments in technology and the needs of the users. Taking care of this situation, it was decided to establish a similar body for the GHS. both working in the same way as the previous Committee of Expert on the Transport of Dangerous Goods. The GHS is then amended every two years on the basis of the proposals discussed in the UNSCEGHS. When, for a proposed amendment concerning physical hazards, there is the necessity for a detailed technical discussion, the UNSCETDG is generally charged for such a work, due to the fact that it was recognized that the UNSCETDG has the necessary competence for dealing with physical hazards. This structure allows that the amendments to GHS are evaluated in parallel by the UNSCETDG so that transport regulations are harmonized with GHS. Looking at CLP Regulation, it has to be noted that, for the moment, after his publication at the end of 2008, and notwithstanding the publication of 3rd and 4th edition of GHS, CLP Regulation is still based on the 2nd edition of GHS. The criteria for classification in the transport regulations are in line with GHS and then, as far as the Regulation (EC) 1272/2008 (CLP) is harmonized with GHS, transport regulations are generally harmonized with CLP. However, on the basis of the "building block approach" (see paragraph 1.1.3.1.5.1 of the GHS), transport regulations do not cover all the hazards classes of the GHS, neither all the hazards classes of CLP, as it can be seen by looking at Table 1. The main difference is concerning the health hazards. In transport regulations hazards such as germ cell mutagenicity, carcinogenicity, reproductive toxicity, etc., are not considered. The reason for that can be found in the initial approach used for defining the relevant hazards in the transport sector. It was assumed that the hazards from transport, due to the specific conditions of the transport itself (a transport unit in movement, a quantity of dangerous goods "limited" with respect to the quantity available in fixed installation, an easier way for people of going far from the accident), are characterized by a "short" exposure of the people involved in some accident. And it was then assumed that hazards like carcinogenicity, etc., can be a serious problem only in the case of repeated and prolonged exposure (which, as said, is not the case for transport accident). It has to be noted that these assumptions (which however have never been consolidated in a formal text) have been questioned in the last years. Reference was made, for example, to some results which give evidence to the development of cancer after a single exposure. And reference was made to the fact that in transport regulations substances like asbestos and PCB are however classified as dangerous substances (in Class 9: miscellaneous dangerous substances and articles). Some countries (in particular Italy) have asked for inclusion of carcinogens, mutagens, etc. in the transport regulations, but, up to now, the majority of the members of the UNSCETDG didn't agree with such proposal. For the health hazards covered by transport regulations (i.e. acute toxicity and skin corrosion) the harmonization with CLP however is not complete. First of all, on the basis of the "building block approach", the hazard from acute toxicity is limited to Categories 1, 2 and 3 (and, as recognized by GHS, the classification for toxic by inhalation substances is based, in transport regulation, also on the evaluation of volatility). As far as corrosion/irritation is concerned, up to now transport regulation are considering only skin corrosion and the criteria are only based on test results: however discussion is going on in the UNSCETDG to achieve a higher level of harmonization with GHS/CLP. The situation for substances hazardous to the environment is still evolving towards a higher level of harmonization, the delay in such process being caused by the pre-existing major differences between modal regulations. One main difference among CLP and transport regulations, looking to the substances hazardous to the aquatic environment, is deriving from the application of the "building block approach": only Category acute 1, chronic 1 and chronic 2 are covered by transport regulations. On the other side it is relevant to note that, in order to facilitate the duties of shippers of dangerous goods, in the European land transport regulations (ADR/RID/ADN) a clear reference is made to CLP so that a substance classified as hazardous to the environment in CLP is classified in the same way in ADR/RID/ADN. It has also to be noted that up to now no reference is made in transport regulations to substances hazardous to the ozone layer. As mentioned before, the criteria for physical hazards contained in the GHS have been derived by the criteria developed in the transport sector. That entails that there was no need, in the transport sector, for many changes in order to harmonize with GHS. Some differences in respect of CLP are deriving, also for physical hazards from "building block approach". For example, in the case of flammable liquids, only Categories 1, 2 and 3 are covered in transport regulations. It is relevant to note that in transport regulation other hazards are considered, which are not covered by CLP (and GHS). - other dangerous substances (such as: elevated temperature substances, genetically modified microorganism, lithium batteries, etc.). While labels, according to CLP, are meant to contain several information (pictograms, signal words, hazard and precautionary statements, etc. ), in the "language" of transport regulations labels are what in CLP is defined as a pictogram. Due to the fact that CLP pictograms were derived from the transport label (of course for hazard classes and categories covered by transport regulations), there was no need to change the existing system of labelling for the transport. So, in the case of a packaging used for transport, for hazard classes and categories covered by transport regulations, the transport label is used and the CLP pictogram is unnecessary. 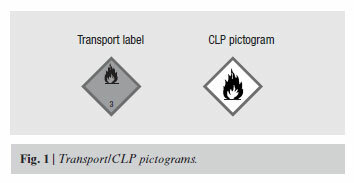 For example, on a drum containing flammable liquids (Category 1, 2 or 3), the transport label shall be placed on a drum: while the CLP pictogram is not requested (Figure 1). There are no potential conflicts of interest or any financial or personal relationships with other people or organizations that could inappropriately bias conduct and findings of this study. 1. European Parliament and the Council of the European Union. Regulation (EC) n. 1272/2008 of the European Parliament and of the Council of 16 December 2008 on classification, labelling and packaging of substances and mixtures, amending and repealing Directives 67/548/EEC and 1999/45/EC, and amending Regulation (EC) no. 1907/2006. Official Journal of the European Union L 353, 31/12/2008. Available from: http://eurlex.europa.eu/LexUriServ/LexUriServ.do?uri=OJ:L:2008:353:0001:1355:EN:PDF. 2. United Nations. Globally Harmonized System of Classification and Labelling of Chemicals (GHS).Third revised edition. New York and Geneva: UN; 2009. Available from: www.unece.org/trans/danger/publi/ghs/ghs_welcome_e.html. 3. United Nations. Recommendations on the Transport of Dangerous Goods - Model Regulations. Sixteenth revised edition. New York and Geneva: UN; 2010. Available from: www.unece.org/trans/danger/publi/unrec/mr_pubdet.html. Accepted on 12 April 2011.